DAYTONA BEACH, Fla. — Five weeks after the death of Joe Gibbs Racing president J.D. Gibbs, the driver he discovered won the Daytona 500 for the second time. 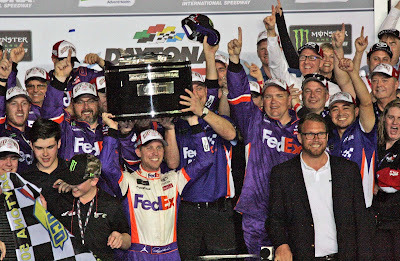 In a two-lap dash in overtime Sunday at Daytona International Speedway, Denny Hamlin held off teammate Kyle Busch to win the 61st running of the Great American Race, an event that featured massive fireworks with five late cautions that left 14 cars on the lead lap at the finish. 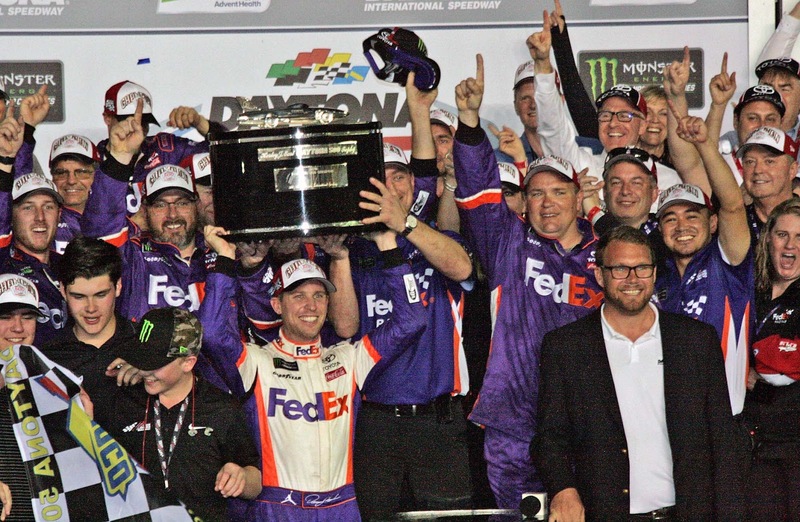 The victory was Hamlin’s 32nd in the Monster Energy NASCAR Cup Series, and it broke a 47-race drought for the 38-year-old from Chesterfield, Va., who had stickers on his No. 11 Toyota Camry commemorating J.D. Gibbs and Glen Wood, patriarch of the Wood Brothers Racing team who passed away on Jan. 18. “It was just one of those days where I felt like it was meant to be,” said Hamlin, who was paired with new crew chief Chris Gabehart. “Hats off to Kyle as well. I know he was eagerly wanting his first victory in the Daytona 500, but today we just weren’t going to be denied. Understandably, team owner Joe Gibbs was overcome with emotion when talking about his late son after the race. Busch chose the bottom lane for a restart on Lap 199 of 200, but Hamlin surged ahead on the backstretch moments before contact between the Fords of Clint Bowyer and Michael McDowell triggered a nine-car wreck that forced overtime. NASCAR stopped the race for the second time for the clean-up, and Hamlin chose the top lane for the final restart on Lap 206. By design, Hamlin pulled down in front of Busch as the cars headed for Turn 1 and held the lead the rest of the way, as Busch, Joey Logano, McDowell and Erik Jones fought for position behind him. Hamlin crossed the stripe .138 seconds ahead of Busch, who was frustrated in his 14th unsuccessful attempt to win the 500. “When he gave me the top (on the Lap 199 restart),” Hamlin said, “I was literally doing a little cheer in my mind, thinking my playbook said, ‘Always choose the top no matter who’s behind you — it doesn’t matter.’ I’ve been on the front row for so many restarts and lost ‘em because I’ve been on the bottom. Busch didn’t regret his decision to let Hamlin drop down in front of him after the overtime restart. “Strength in numbers,” Busch explained. 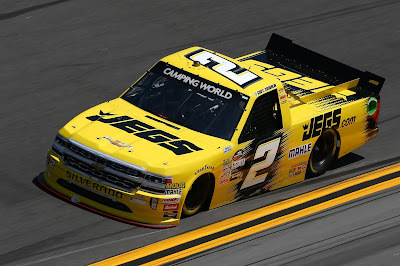 “We were trying to protect at least one of our cars being able to get to Victory Lane, and I felt like we were able to do that with being able to do what we did on that last restart. “But, overall, it’s certainly bittersweet. It’s awesome to see a JGR car in Victory Lane with Joe and J.D. and everything that’s gone on this offseason with all that. But it’s very, very bittersweet for all those that support us and all my team guys that work so hard to try to get to Victory Lane and get our Daytona 500 victory. What had been a relative calm race turned chaotic in the late going. After a restart with 10 laps left, all hell broke loose as the field approached Turn 3. Contact from Paul Menard’s No. 21 Ford sent Matt DiBenedetto’s No. 95 Toyota spinning into the outside wall and back across traffic. By the time cars finished wrecking, 21 cars had sustained damage ranging from minor to catastrophic. 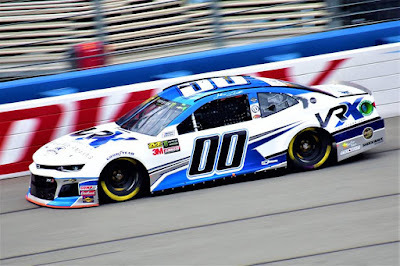 DiBenedetto was eliminated from his maiden run in the No. 95 Leavine Family Racing Toyota Camry, leaving Menard to do a mea culpa when he exited the infield care center. 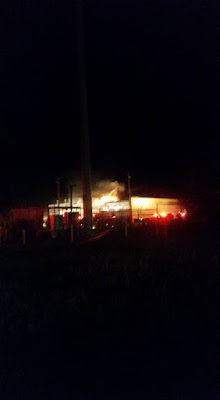 “I’m not really sure what happened,” Menard said. “I hooked the 95. I was trying to get to his outside, and he was kind of in the middle and he went to the outside and was going back and forth. The 12 (Ryan Blaney) had a big run, so I jumped up in front of him and hooked the 95.